Get to Know the New, Improved, Imperfect You! The architects of pop culture have never been the leading authorities on what is best for you. So turn your back on the lies that you are not thin enough, not successful enough, and not glamorous enough! Physical perfection is not the goal. Instead, let Karen Scalf Linamen take you on a journey from a limiting and unhealthy body-image to a life of feeling good about yourself—body included. 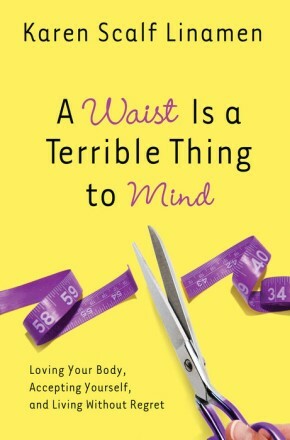 When you learn the secrets in A Waist Is a Terrible Thing to Mind you can change what you crave, what you eat, how you think, and ultimately how you live. Along with Karen’s trademark humor, you’ll find practical, common-sense tools to help you accept who you are today and take the steps that will make you the person you were created to be. Along the way, you’ll enjoy the new, improved, imperfect you!